The last month has been particularly busy for me. 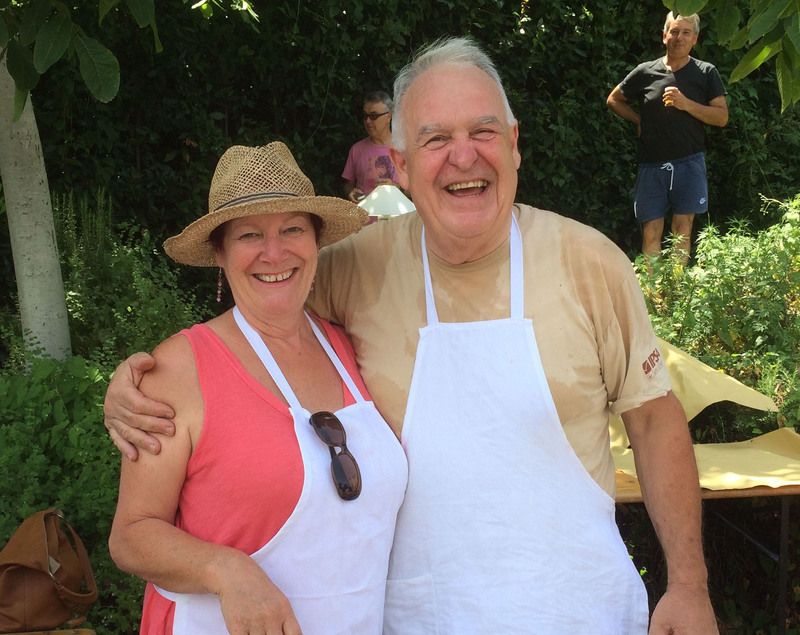 After a trip to the UK visiting friends and family we got back to Italy in time for the Festa De le Cove which I blogged about last year. (Festa 2013) It was a good weekend once again despite some bad weather but somehow the clouds dispersed and the sun came out just before the main parade of floats. There weren’t many this year but, one was spectacular and I’ve put up a photo. The following weekend I was responsible for organising a joint 60th birthday party for a couple of old friends, one from England and the other a resident in Sydney Australia. These two chaps had been at university with The Man (many years ago) and more friends joined us all for a fun packed weekend. For the main event on Saturday 19th we invited a few Italian friends to tag along and planned an English summer fete with cricket and coconut shy included. 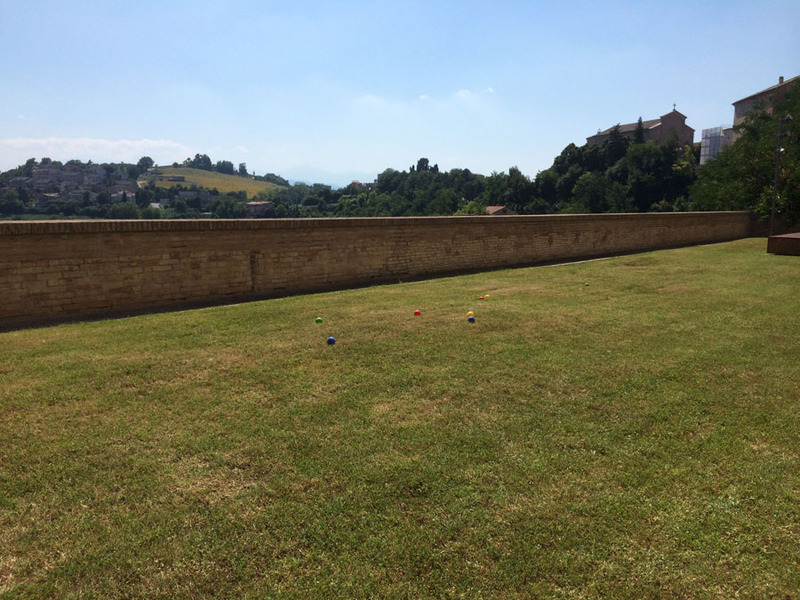 We hired the garden at the back of the Comune (Town Hall),a huge area of grass, a bandstand and a smaller area of with mature trees. The view from the gardens towards the mountain was pretty AWESOME! I use that word for our visitors from Texas! (Sorry I didn’t get a photo) The weather was scorching, far too hot to lob balls at either a coconut or a cricket bat until at least 8pm! We managed to set out the tables and benches under the trees and fortunately for us a door had been left open to one of the ground floor rooms which was empty and cool so we set up the tables in there for food and alcohol. Naturally there was Pimms on offer. The Italian guests had never supped this delicious beverage and after a first cautious sip they guzzled away! The Man made sure everyone had a turn at bat and a chance to bowl in the cricket and that equal opportunity was given to bash a coconut down. He ran the events in his own inimitable fashion – in other words – no one quite understood the rules. It was a knockout kind of thing. Prizes were indeed won! Petritoli fridge magnets were awarded to first, second and third in both events. Is there no end to The Man’s generosity? There were some happy faces around. On Sunday 20th I arranged for a bit of pasta making. 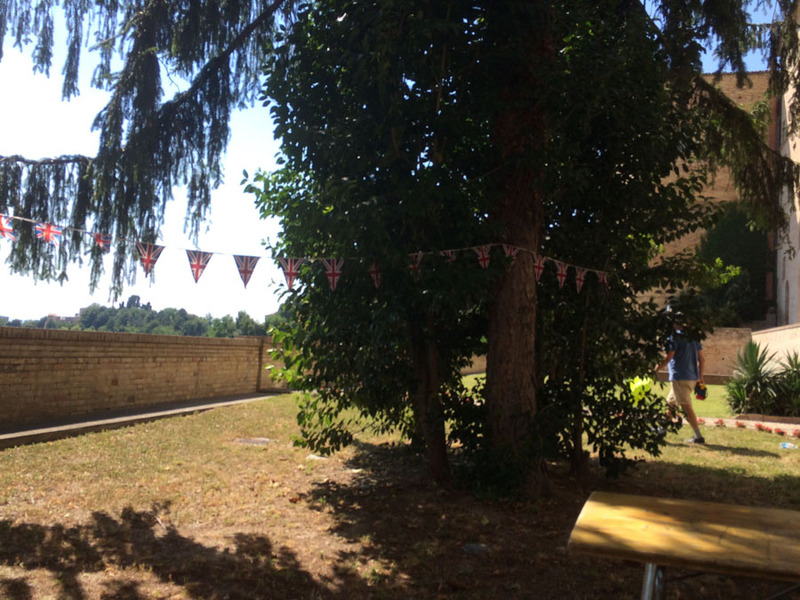 It was again a very hot day but with tables under the trees, a few beers keeping us hydrated a jolly time was had by all at La Scentella with our friend Roberto Ferretti. 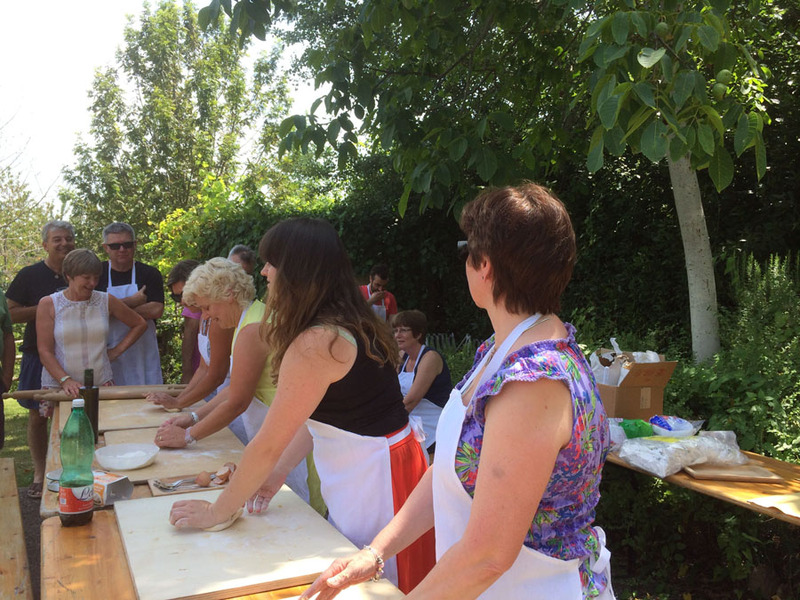 Roberto gave a demonstration of how to make fresh tagliatelle the way they do it in Marche…secret ingredient? A little vino cotto. This is ‘cooked wine’ and tastes a little like Madera, it’s traditionally given at the end of a meal with almond biscuits or cake which you dip into the liquid. Delicious. Roberto allowed four people to give a hand. It was hard work ‘kneading’ the dough for a good fifteen minutes and luckily no one lost a finger when carefully cutting the prepared dough. Looked pretty dangerous though, I thought at least one pink painted fingernail might end up on our plates! Twenty-four people sat down to eat after the demonstration. Roberto prepared a feast for us, it was a completely vegetarian meal and even though the majority of the guests were carnivorous I never heard one complaint. In fact the opposite was the case. We had a small taste of the pasta prepared by our friends, followed by a massive plate a pasta that had been made earlier. The tomato sauce served with it was simple but delicious, wild celery was detected, I understood it to be a herb, quite distinctive. Roberto is a keen herb grower and can easily identify any wild herbs growing in the fields. I’ve often seen him out with his carrier bag searching and collecting. 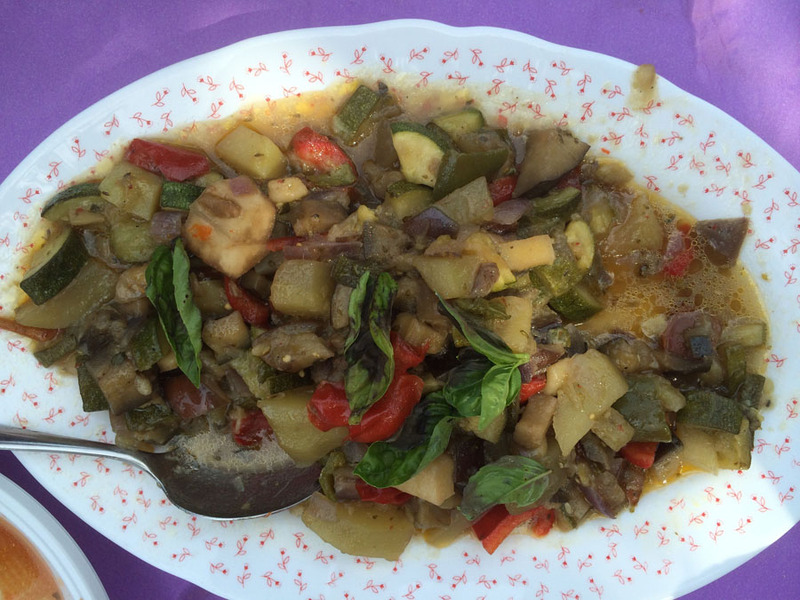 The next dish on the menu was a fabulous ratatouille with potatoes, peppers, aubergines, tomatoes and herbs. Roberto is a very good cook. The food was amazing but what really made the meal perfect was firstly the company; close friends and family. 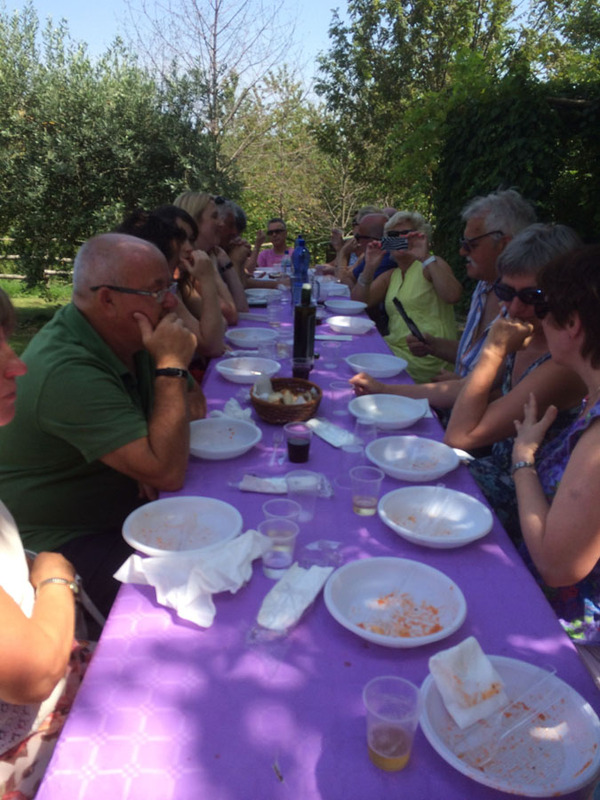 Secondly the ambience; we were eating outdoors, seated around a long table, everyone talking, laughing drinking and eating in the shade of a few trees, surrounded by lavender and rosemary bushes. 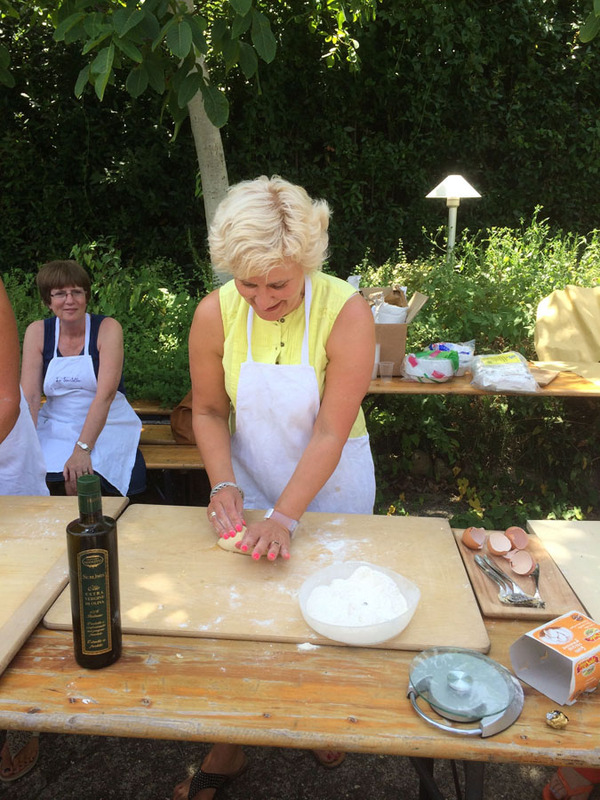 Our guests from Australia, the UK and America were given the true Italian experience. The Man and I think we’re very lucky to be able to enjoy this lifestyle all the time. I stupidly didn’t get the recipes for the sauce or ratatouille but I do remember the pasta. Basically, 100 grams of strong flour, an egg, some oil and about a teaspoon of vino cotto…and…a great deal of elbow grease. I’m going to try it soon, I’ll let you know how it goes. Phew a long blog from me this week, but there was a lot to write about. Actually, this barely covers half what we all got up too but don’t want to get boring! 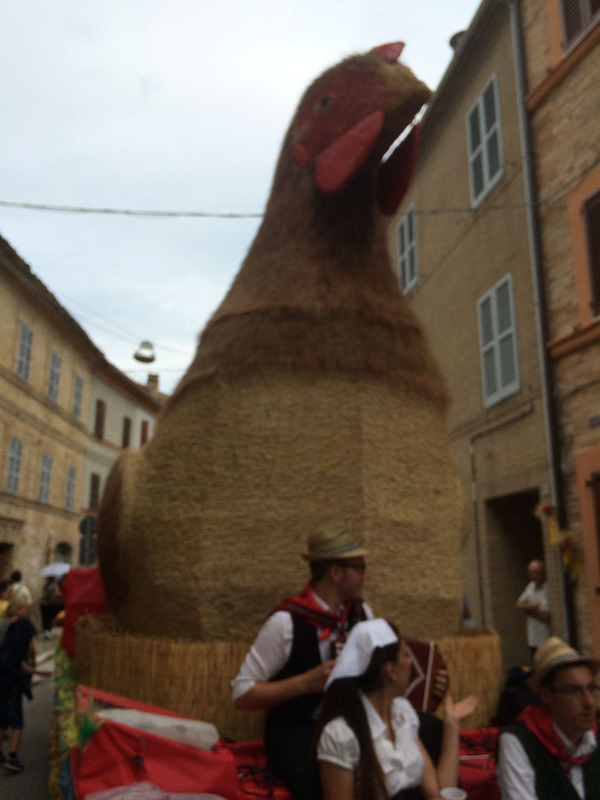 This entry was posted in Family, Festivals and other events, Food, Le Marche and tagged coconut, cricket, fete, food, friends, Garden Party, herbs, italian, pasta, Pimms by Ninette90. Bookmark the permalink. yum yum … absolutely fabulous stuff – as was OPV’s organisational ability before during and after “il buon weekend”… and the International Supper to look forward to in about 3 hours!! 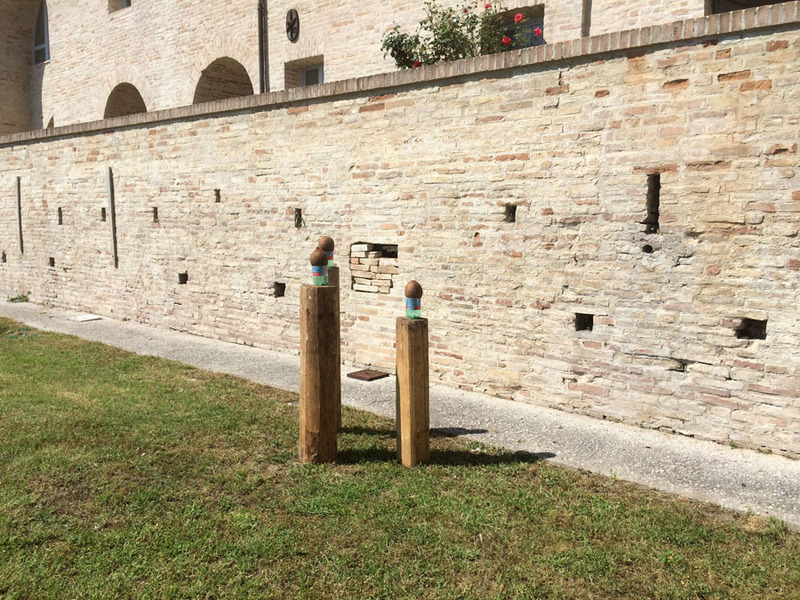 How much fun can a boy have here in the Bel Paese?? That wasn’t boring, in fact would love to know more about the Weekend!!! It was and is Sophie, except this evening storms are threatening! But we have an International Dinner in Petritoli when all the different nationalities who live here cook something from their home country and we get to taste twenty or more different dishes. 🙂 Think we’re going inside for this one!